Sigiswald Kuijken's Bach cantata pilgrimage is taking in fewer stops than those of his contemporaries – he is recording a single cantata for each Sunday of the liturgical calendar – but it is still an ambitious project. And the comparisons that it is up against are daunting to say the least; we are in one-to-a-part territory here, but there are already plenty of those about. SACD? An excellent decision by somebody at Accent, but it invites comparisons with Suzuki's superlative cycle. 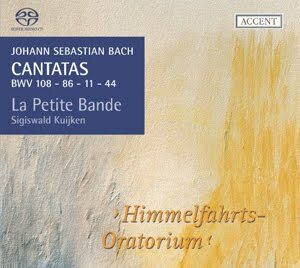 Then there is Kuijken's own back catalogue, which itself contains some of the greatest Bach Cantata recordings ever made. He is on form though, and this disc holds up well against his earlier offerings. La Petite Bande is a good deal more petite than it was in the 1990s, and it has lost a few of its greatest stars. Marcel Ponseele, perhaps the greatest ever exponent of the baroque oboe, has departed the ensemble and is sorely missed. However, his replacement, Patrick Beaugiraud, is a player of the same school, and while he doesn't quite manage the variety of articulation of Ponseele's obbligato lines, he nonetheless achieves a similar level of musicality and lyricism. His is the first solo turn, in the bass aria "Es ist euch gut, dass ich hingehe" of BWV 108 and it is an impressive start to the disc. Comparisons with Masaaki Suzuki are instructive as both make the most of the SACD technology to create real intimacy. But where Suzuki's forces excel in perfecting the ensemble and phrase structuring, Kuijken is happy for a little imprecision to creep in. The tuning in the strings is rarely 100%, but that slightly wayward intonation only adds to the sense of immediacy. And unlike Suzuki, Kuijken takes a relaxed approach to the structuring of phrases. It sounds almost intuitive, although I'm sure it is highly studied and prepared, but it allows the instrumental forces to sound all the more vocal for not being overly regimented or controlled. Kuijken is a great believer in the virtue of authenticity, so one-to-a-part is treated as a musical virtue rather than an inconvenient truth of historicism. He is also an advocate of the cello da spalla, an instrument like a large viola but tuned as a cello. Discussion continues as to whether the Cello Suites were written for such an instrument, and until it is conclusively disproved Kuijken is going to use it as the tenor instrument of his string section. This makes for a slightly top heavy sound, or insubstantial rather, but it fits well into his intimate and relaxed tonal palette. One aspect of Kuijken's music making that is well represented on this disc is his own performance on the baroque violin. He plays obbligato in the aria "Ich will doch wohl Rosen brechen" in BWV 86 and it is a triumph of understated baroque elegance, an intricate, weaving line, but with that earthy, grounded tone of gut strings played by somebody who really knows how to play on gut strings. As with so many of Kuijken's previous recordings, it is an example of the sheer variety and musicality that 18th century instrumentation can bring: he may be a partisan advocate of period instruments, but he can always demonstrate why they are superior. None of the vocal soloists really stand out, but that fits Kuijken's approach well. They are, after all, required to be the choir as often as they are given solo numbers. All sing with an absolute minimum of vibrato or ornamentation, neither of which is particularly missed in this relaxed intimate setting. There are one or two tuning issues, but again, in this relaxed setting one or two slightly flat notes hardly seem significant. They wouldn't get away it under Suzuki though, that's for sure. It is a shame that Kuijken is not trying for a complete cycle, because numerous as they already are, he really has something unique to say with this music. The SACD sound really enhances the intimacy; it is as if you have your own Petite Bande sitting in front of you, and every nuance is faithfully and clearly reproduced. You could complain that it is underpowered, or top heavy, or imprecise, or based on a contentious view of Bach's orchestration, but once you have listened to a few minutes all these thoughts will pass. This may not be the last word on Bach, but it is close to the last word on Kuijken's Bach.